I had heard about these guys and was curious to hear them when the CD popped in the mail box! This is the Canadian bands fifth CD and it features some really cool psychedelic jazz rock stuff. The CD starts with a short 1½ minute piece that is quite heavy stuff with the guitarist battling the organ player for space. The next piece takes it slow and easy with piano and spacey sampled sounds before the drums and guitar bring it up as the track becomes a more uptempo melodic track, a bit like a more experimental instrumental Motorpsycho piece. Last Stand at Fisher Farm begins with keyboards and then acoustic guitar but then the trumpets rush in along with the waves of otherwordly sounds that oscillate in the background here and there. You’re Meshugah! is quite a strange one with some really amazing drumming complimented by a harpsichord like keyboard. Cool track. I am not your Sugar begins with a heavy guitar riff and you really feel the bass on this one, which is a short little workout. Demon Jigging Spoon has some great panning synths to start the piece off but develops into a nice melodic piece with some cool guitar. Medicine Missile is the most spaced out of the tracks on the CD with some cool delay guitars before the bass and drums takes the band into another uptempo rock reframe with a cool but too short guitar solo. Lady XOC and Shield Jaguar is track with a more jazzy interplay and a bit Zappa inspired at times, perhaps. 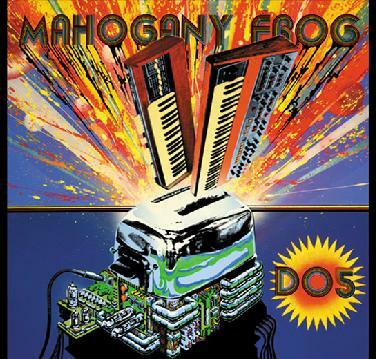 The CD closes with Loveset, a slow spacey track with some frog sounds, and mostly keyboards and trumpets. Interesting way to end the CD.